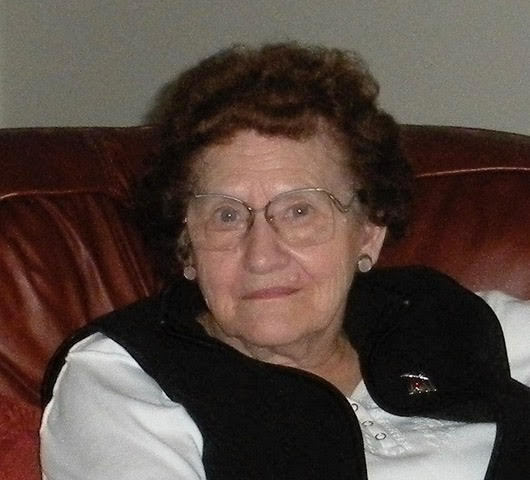 OAKFIELD and BANGOR - Evelyn M. Johnston passed away Wednesday April 3, 2019 at a Bangor hospital. She was born January 3, 1926 in Ludlow, Maine, the daughter of Robert and Ethel (Ross) Burton. In 1939 her mother died and Evelyn, age 13, moved to Oakfield to live with her uncle and aunt, Philip and Grace Burton. She married Clyde Johnston in 1946 after graduating high school in 1944 and remained in Oakfield for most of her life. She worked many different jobs in her youth and spent most of her life as a homemaker. In 2016 Evelyn moved to Bangor to be closer to her son and grandchildren. She was a member of the Oakfield Baptist Church for more than 75 years. She was known for her cooking ability and hospitality. She would set another place at the table for anyone who showed up. Evelyn took great pride in coming from a large family of 14 and tried to keep track of them all throughout her life. Evelyn had so many good friends over the years, and two, Kathleen and Marge, were special friends since childhood. Even after moving away to Bangor she thought of them every day. A special thank you to her niece Florence for all her caring over the years. Thank you Debbie M. for your devotion and friendship. And to all the special card players in Mom’s last years, you made such a difference in her life. She is survived by her son Danny; two grandchildren, Erin York (husband Vaughn) and Seth Johnston; four great-grandchildren, Olivia, Madelyn, their mother Alisha, and Lane and Drew; and two sisters, Betty Ivey of Houlton and Shirley Spellman of Bryson City, N.C. Evelyn was predeceased by her husband Clyde; her parents; her daughter-in-law Ronnee; brothers Oscar, Chester, Robert and Edward; sisters Joyce Burton, Gladys Brown and Doris Grass; half-sisters Josephine Melville Flewelling, Esther Shives and Ruth Wheeler; and half-brother Laurel Gardiner. Special thanks to the caring people at The Country Villa, and Westgate Center for all their love and attention.